Again, two cards jumped out of the deck at me today: the Two of Swords and the Seven of Wands. To me, this combination says that we find ourselves making a difficult choice today, and I am proud of us, because I see us choosing the difficult path that involves struggle and hard work, not the easy path (if there ever is an easy path). 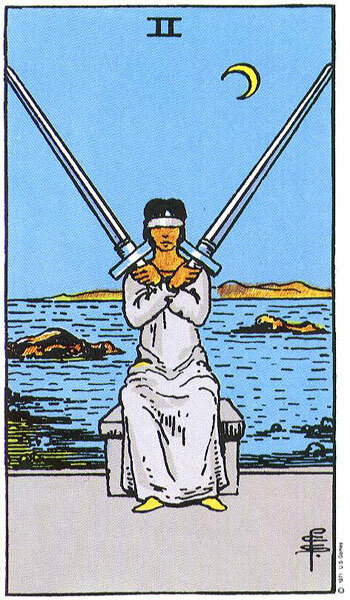 The woman on the Two of Swords card is blindfolded and can’t necessarily see which choice will be easier, but she senses it, and either way, she knows — we usually do know — which path is the more ethical one. 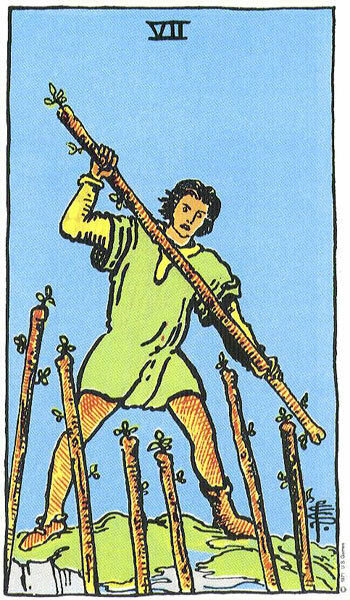 That choice, once made, leaps us straight into the Seven of Wands scenario, where we find ourselves standing up and fighting for what we believe in. It’s a struggle, but look at the card — this isn’t a struggle that will defeat us. It’s a fight we can win if we are willing to put some effort into it. And we are. Previous Prognosticating About Politicians: The Empress: Will a Woman Enter/Affect the Race? Next Card for the Day: The Hierophant–Reversed! Institutions Upside-Down?